If you need to see the Code of Conduct, here it is for you ladies and gentlemen out there. 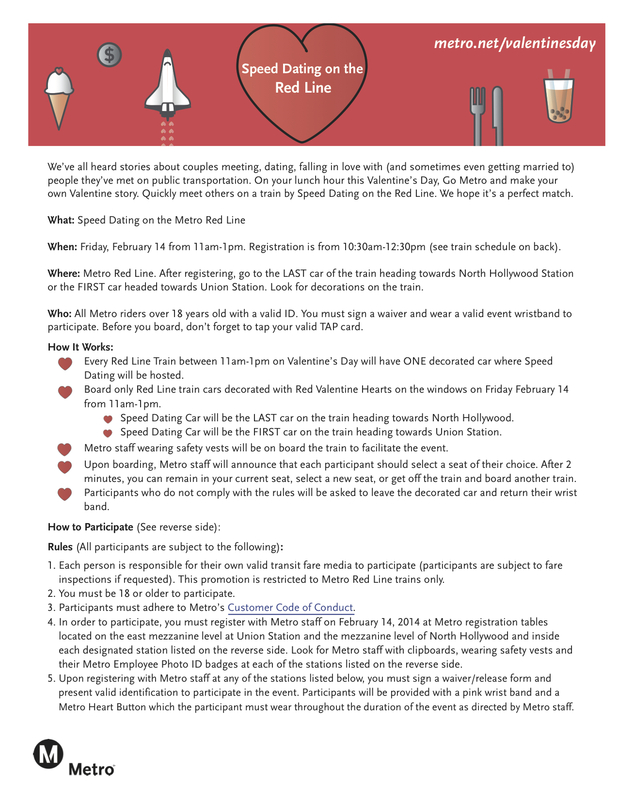 Finally, there’s a rumor that Cupid may be making a live appearance on the Red Line next Friday. This is fine so long as Cupid has a valid Metro fare loaded on his/her TAP card and remembers to tap. You’re over a month and a half early for April Fools’. Cute idea! The hours are a little difficult though. The DTLA group asked if this is an LGBT friendly event. All are welcome! We will not be screening for anything other than your age (please be 18 and over). As long as you have a TAP card and have paid fare, you can participate. I think it’s a fun idea with nothing but good intentions behind it, however, I don’t think a lot of people would attend to this event. It could be an amusing experience if you go with a few of your singles friends (just to feel safe) and say you tried something new. Either way, it will definitely be a story to tell. Good Luck! Thanks for your kind wishes, Gali! 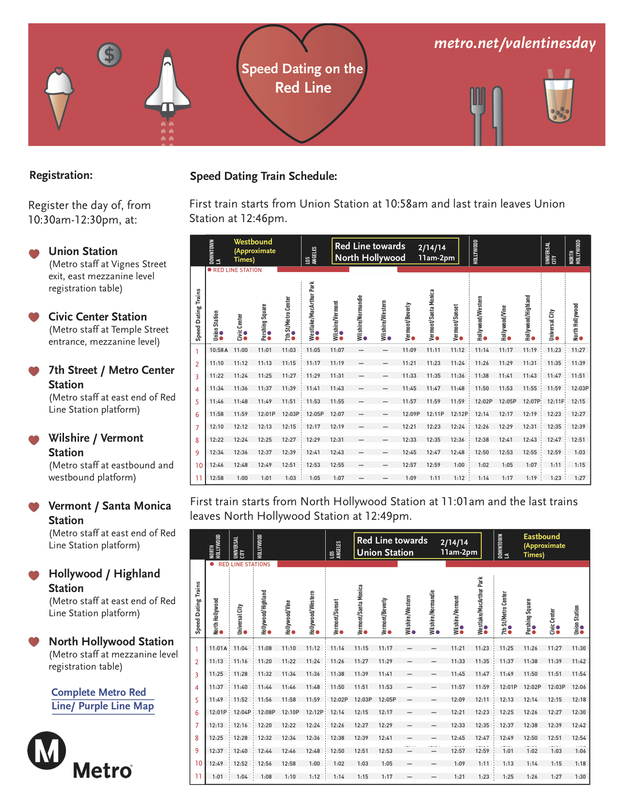 We’re hoping those who are in the DTLA area who are heading out for lunch anyway will drop by…at the very least, maybe try to take some photos with our Metro Cupids. I think the concept is hilarious and fun! I only wish i worked in the DTLA area to participate in this community event. Keep pushing the limits with innovative ideas and Happy Valentines Day! Many may be working professionals out for a nice Friday lunch activity…gotta think positive, Jane. I agree with Jane not just on this, but other weekday events. I love Metro and ride it whenever I head into Los Angeles instead of driving everywhere. Some of the events sound great, but always happen way too early for me to make it after work. Somethings starting at 6 or 7 would benefit many of us. I think this is inventive and creative of Metro. This is great and the city needs more fun things like this! This is awesome, but unfortunately I work a job where randomly taking a 2 hour lunch isn’t exactly acceptable 🙁 I agree with Vinny above, they should hold this after 6 or 7. While the event runs for 2 hours, you’re welcome to stop by for as long as you can! Even if it’s just to take a short ride on the decorated train cars. Hmm…it is tempting, but it’s also an invitation to crash and burn. I’m more of an acquired taste. What would be really nice is if Metro would not take additional free parking spaces away at the Universal City Red Line Station. Making more and more parking spots permit only is really not a good way to encourage people to take Metro.